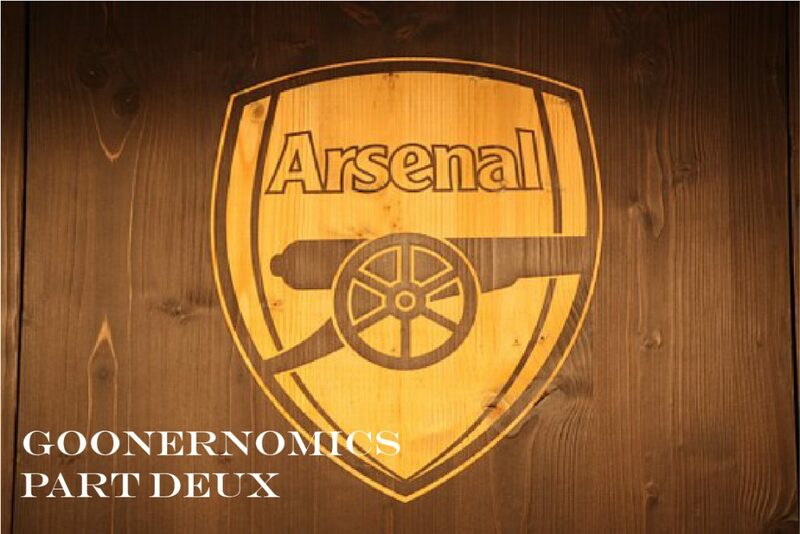 Given the announcement that Arsene Wenger is to step down after 22 years in the position of Arsenal manager, we thought it would be a good idea to repeat and update where possible our ‘Goonernomics’ blog article which was first released in October 2017. There is no doubt that he has been hugely influential in the thinking and development of not only Arsenal but also the Premier League and football in general. However, in recent years the club’s economic position has not been conducive to repeating the dominance evident in the first half of his tenure. We take a look through the economic lens to see why. It is not our intention to write a ‘blog’ every time a club from the Premier League publishes their latest accounts. However, in this case we will make an exception – the fortunes of Arsenal regularly crop up as a discussion point when we deliver presentations as part of our work with clients. 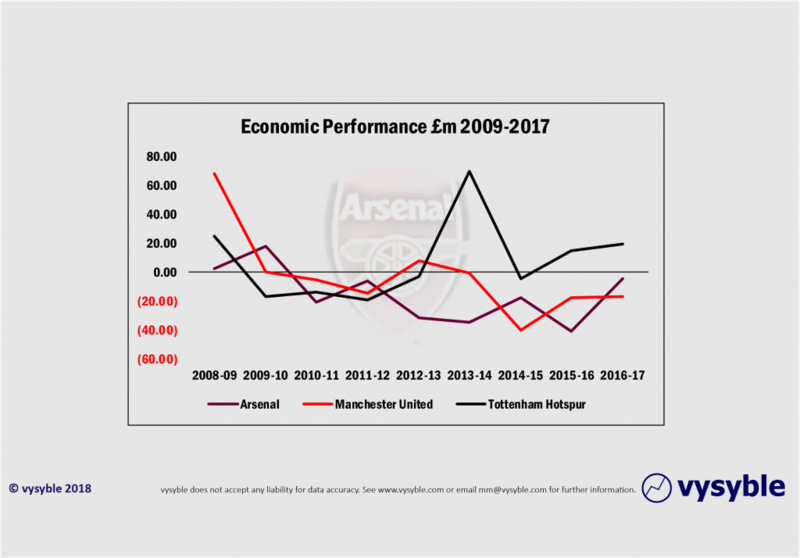 Arsenal may not have won the Premier League since the 2003-4 season but after Manchester United, it is the club where the most questions regarding the club’s economic position are forthcoming. With several well-known “celebrity” fans – Piers Morgan is a regular commentator (and latterly a critic of the club’s manager, Arsene Wenger) – plus Idris Elba, Colin Firth, Joan Collins, Barbara Windsor, Alan Parker, Sam Mendes, Rory McGrath, Nick Hornby and Roger Waters ranking amongst the long-list of high-profile personalities who have pledged allegiance to the North London club, it is not entirely surprising that interest in the club is so high. Indeed, when one looks in isolation at the club’s revenue performance over the period 2012-17, one can only be impressed. The club has produced an absolute increase in revenue of £181m or 74% and furthermore at a compound rate of growth 11.8% per annum. Fig. 1. 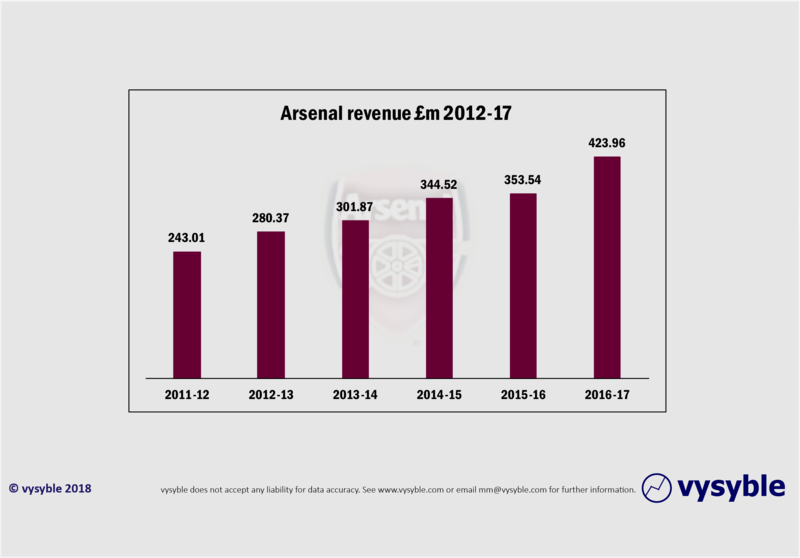 Arsenal’s revenue growth profile. Our clients in the commercial sphere would undoubtedly envy such performance and when viewed through this lens the club’s “Bank of England” reputation would appear to be in safe and secure territory. Goizueta was referring to the difficulties managers, owners and executives have in saying “no” to revenue even when it is clearly value-destroying as well as highlighting the dangers of judging the economic health of an organisation purely from the revenue line. Sadly, and despite the great man’s wise counsel, the myth that all revenue is value-enhancing perpetuates to this day. It is something that is experienced almost daily in business consulting. We prefer the use of economic profit defined as net operating profit after tax less a charge for ALL the capital used by the organization. Furthermore, when working with clients, we advocate looking at economic profit over time. Fig.2. Over the period 2012-17, revenues equalled £1.9bn. However, there is an improvement in economic performance with the club posting a relatively minor loss of £4.4m in 2017 although over the six years of analysis, the club has produced a total economic loss of £133.8m without any incidence of a surplus. What is going on here? Despite impressive revenue growth and whilst there is a significant improvement in 2017, the club has not produced a positive economic profit over the last six years. Often the best way to discern organisational performance at a more detailed level is to analyse the movement across the constituent parts of the economic profit calculation; in this case revenue, costs including taxation, NOPAT, the charge for capital and the resulting economic outcome between the beginning and the end of the analysis period. Fig.3. The increase in revenue is £181m whilst costs have increased by £175m. The capital charge has increased by £5m which means that there is an overall reduction in economic losses of £1m. Evidently, and more importantly, revenue and costs are broadly in line. What this evidently illustrates is that the impressive growth in revenue, which amounts to £181m between 2012 and 2017, has been closely matched by an increase in expenditure with costs rising by £175m over the period. This demonstrates the danger of judging organisational performance on revenues alone as, in this case, we can clearly see that almost all the impressive revenue growth has been taken in expenses. Fig. 4. 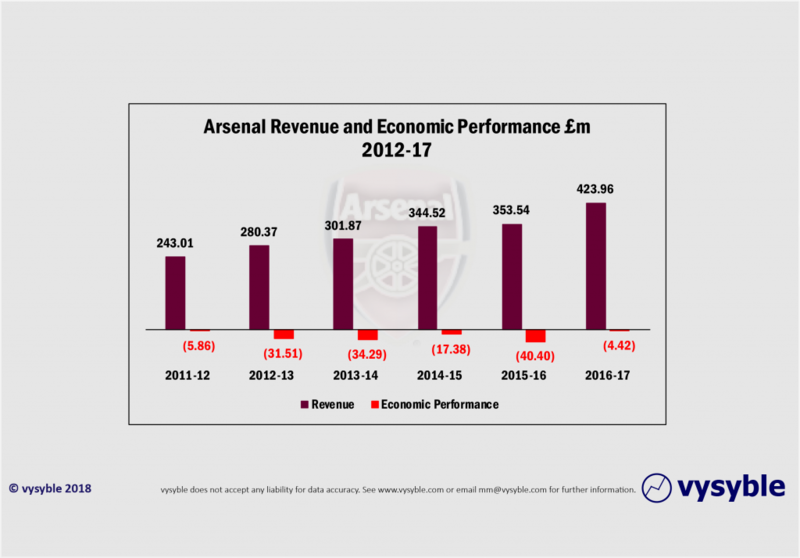 Arsenal’s economic performance has been one of steady, if shallow, decline since 2010. Overall, Arsenal’s North London neighbours Tottenham Hotspur (under the excellent stewardship of Mr Levy) is in economic surplus. Over the six years from 2012 through to 2017 the club produced an economic surplus of £73.01m. 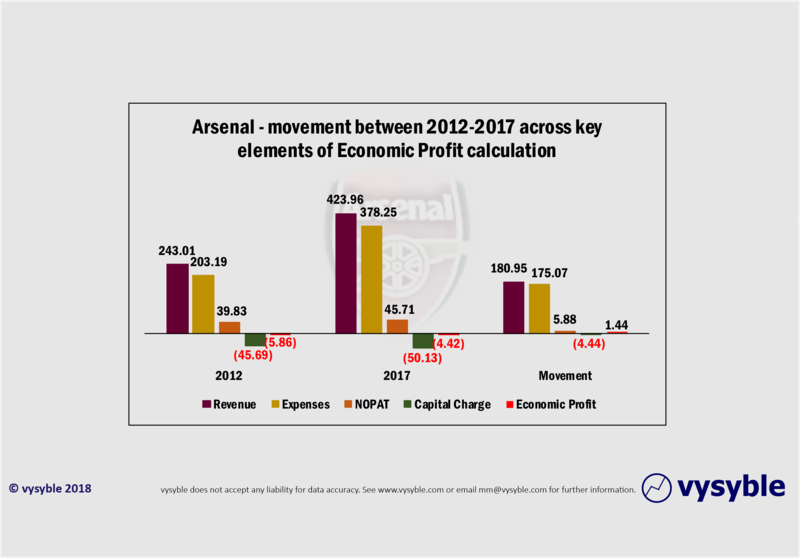 By contrast, Arsenal’s economic loss over the last six years is £133.8m despite the club’s significant economic improvement in 2017. Over the same period, Manchester United posted an economic loss of £80.9m which, given the size of its balance sheet and the geographic spread of its revenue base, is not remotely terminal but nonetheless it will need to be managed going forward (and we have every confidence that it will be). 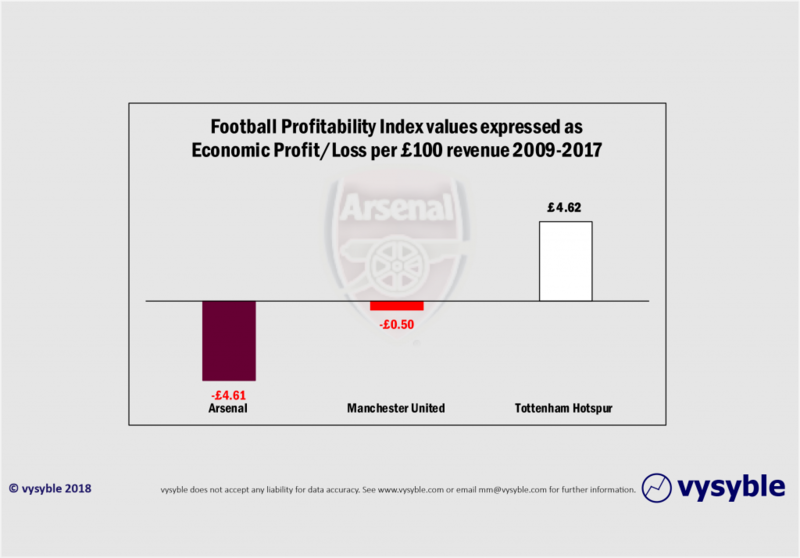 In terms of economic efficiency, when we look at the relationship between economic profit and revenue, we can see just how far Arsenal is behind both its North London rivals and its traditional Mancunian adversary. Fig. 5. An £8 per £100 of revenue economic differential exists between the North London neighbours. Nobody is pretending that Arsenal’s economic position is terminal but perhaps this work does shed some light on Arsene Wenger’s apparent reluctance to spend aggressively in the transfer market over recent years. Furthermore, there is evidence in the most recent numbers that economic performance is improving. Whether it will prompt the board to revise the club’s transfer policy remains to be seen. Perhaps the new manager will be more persuasive in dealings within the boardroom. All that said, from our other work we have seen that in the first year of a new domestic TV deal, economic performance across the entire Premier League does improve, usually for a solitary season before normal service is resumed and the trend reverts into more challenging economic territory in the subsequent years of the TV contract cycle. Given the latest round of TV contract dealings, the next 5 years will present some significant challenges. Also, the gap between Tottenham Hotspur’s 6-year track record of economic profit and Arsenal’s 6-year total stands at £206.43m – a sum that is more than enough to purchase two decent central defenders or perhaps the more productive half of a certain Lionel Messi. This is an economic differential that may shrink in time depending on how Spurs fare with the financing of its new stadium but is does illustrate the current divide between the two clubs in terms of economic performance. Against this background (and again stressing that the position is certainly not terminal), the club’s reputation as English football’s “Bank of England” and the reasons why Arsene Wenger was latterly hard-pressed in attempting to overhaul the dominance of the Manchester and West London Premier League clubs requires a degree of re-evaluation. In our opinion he has done a fine job and a Europa League triumph would indeed be a fitting conclusion.